2-6 (4 pre generated PCs incl.). A Boarding House is a meeting place for strangers. When one of the tenants appears murdered, everyone is a suspect. An intricated pulp horror scenario where the players will face their own humanity to give a solution to the enigma. 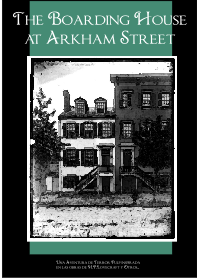 The Boarding House at Arkham Street is an adventure for Horror RPGs inspired by the works of H.P. Lovecraft and his circle, and that aims to represent the Pulp mood typical from the 30's in the United States. It is not prepared for any gaming system, but it should be easy for you to adapt it to your preferences without much effort. In this adventure, the characters are part of the residents in a Boarding House during the Great Depression in the United States, when the winds of war in ye olde Europe begin to be heard. Recommended for players mildly or highly experienced. Descriptive Statistics: Usable with any Gaming System.